Google's Eric Schmidt once said that thanks to smartphones that are always with us we will have access to all of the world's information at any time, and boredom will thus be eliminated. Seeing what people are coming up with on YouTube to keep themselves and us entertained, we say he was spot on. 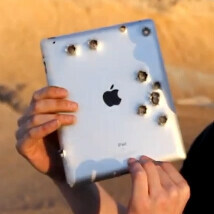 Ever wondered what will happen if an iPad 2 meets a Minigun? If not, you are not alone, but someone did schedule a meeting nonetheless. In the video below Apple's newest tablet gets shot with a true Gatling-style helicopter Minigun, a thrill that no Angry Birds clone can reproduce. The screen gets shattered, but overall the tablet holds itself pretty well - doesn't fall apart into pieces, that is, considering the 7.62mm rounds pounding it. The whole thing doesn't serve any practical purpose, but the entertainment value is priceless. Our favorite quote: "Even with Facetime that iPad 2 ain't gonna see it coming". Oh, and there is a super slow motion rerun, too, for your viewing pleasure. We won't be warning you not to do this at home, since we assume getting access to a Minigun will be a big enough hurdle.